Lenore Tawney in her Coenties Slip studio, New York, 1958. Lenore Tawney (b. 1907, Lorain, Ohio, USA; d. 2007, New York, USA) was an American artist who became an influential figure in the development of fiber art, drawing, collage and assemblage. Introduced to the tenets of the Bauhaus at László Moholy-Nagy's Chicago Institute of Design, Tawney's work was also shaped by her spiritual practice, which was informed by Western mystic and Eastern philosophies. Tawney was one of the instigators of a new language for fiber, and transgressed traditional hierarchical boundaries between craft and fine art. 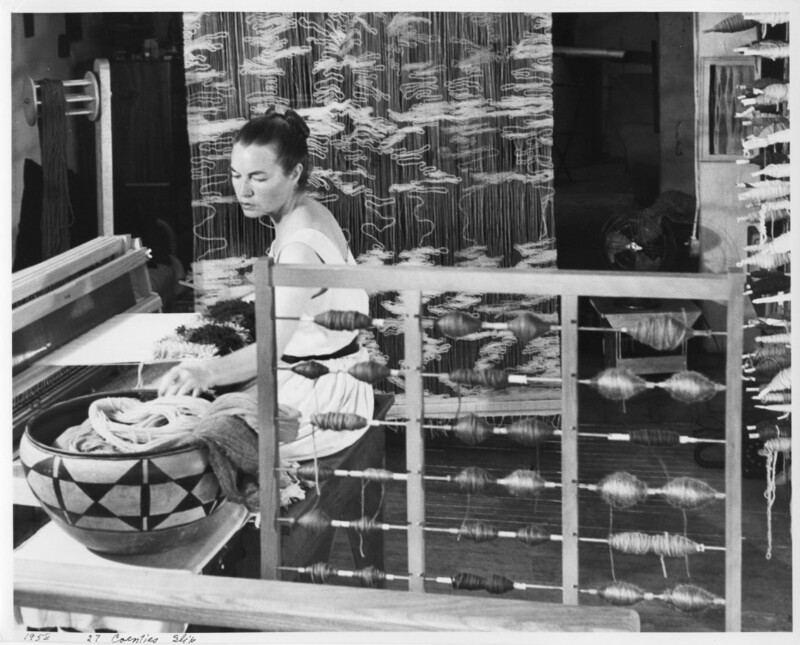 Tawney is best known for developing unique methods of weaving with which she was able to move past the traditional rectangular shapes of textiles into three-dimensional sculptural forms. In works ranging in scale from intimate to monumental, space and light behind the woven fabric remain intentionally visible and integral to the work. Beginning in the 1960s, she began to work in drawing, collage, and assemblage. From 1974 Tawney integrated weaving and collage, sometimes incorporating items collected while travelling into the woven forms resulting in works which take on a ritualistic character. Tawney's work has been written about extensively. Key monographs and publications include Lenore Tawney: Signs on the Wind with text by Holland Cotter (Pomegranate Communications, 2002); Women's Work: Textile Art from the Bauhaus with text by Sigrid Wortmann Weltge, (Chronicle Books, 1993) and Lenore Tawney (Rizzoli, 1990), published in conjunction with Lenore Tawney: A Retrospective at the American Craft Museum, 1990. Tawney's importance has been recognised in recent major group exhibitions including Between Land and Sea: Artists of the Coenties Slip, Menil Collection, Houston, TX (2017); Making Space: Women Artists and Postwar Abstraction, Museum of Modern Art, New York, NY (2017); Thread Lines, The Drawing Center, New York, NY (2014); Fiber Sculpture 1960-Present, The Institute of Contemporary Art, Boston, MA (2014) (national tour) and Art & Textiles: Fabric as Material and Concept in Modern Art from Klimt to the Present, Kunstmuseum Wolfsburg, Germany (2013). A major presentation of Tawney's work is currently on view at Tate Modern, London as part of Materials and Objects: Beyond Craft, curated by Ann Coxon, exhibited through December 2018. Tawney's work is represented in the permanent collections of the Art Institute of Chicago, Chicago, IL; Menil Collection, Houston, TX; Metropolitan Museum of Art, New York, NY; Museum of Modern Art, New York, NY; Tate Modern, London and the Whitney Museum of American Art, New York, NY, among others.